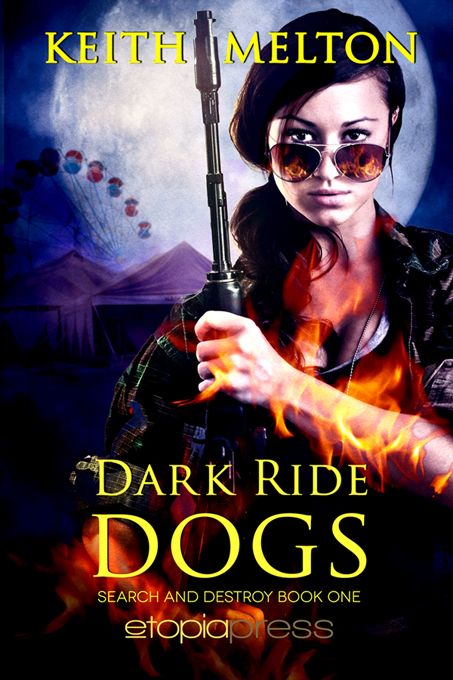 Cover art for Dark Ride Dogs–a new Zero Dog novel coming out at Etopia Press. The book is in edits at the moment. I’m hoping to have it out in 2013, so I’m officially cancelling Christmas for the family so I’ll have enough time to finish. You hear that kids? Consider all that Halloween candy your Christmas loot delivered early! Zero Dog mercenary Andrea Walker used to love fortune cookies—until the day she received a death prophecy inside one. Of course, believing a mass produced fortune from a baked good would be insane—until a berserker shows up on her doorstep claiming he’s been sent by an infamous oracle to save her life. She must hire him or die. Hell really breaks loose when the Zero Dogs are contracted to stop a ghost-summoning goblin’s plan to bring his Eternal Malevolence Carnival and Incredible Show of Evil to Portland, starring a company of ghost performers—clowns, acrobats, and nefarious balloon-twisting mimes. Meanwhile, Andrea’s normally shy succubus friend seems to be falling for the mysterious berserker. Too bad a malfunctioning charm spell has the redcap goblin yearning for her as well. Now Andrea must elude a death prophecy, discover if her new-hire berserker can be trusted, and avert the looming ghost clown apocalypse. Just another mad mission for the Zero Dogs. Update on other things, etc. Working on Shadow Crew (Nightfall Syndicate 3), banging it into shape after beta reader comments, hoping to send it off in Nov/early December at the latest. Then I’ll be back on Spanner Jack and another Zero Dog book–this one with the return of Jeremiah the ambitious, yet hapless, necromancer/zombie overlord in round two with the Zero Dogs. So that’s the current state of this here union.